LRTM Mold Dynamic Seal Starter Kit - JHM Technologies, Inc. The JHM Technologies Dynamic Seal starter kit provides all of the needed component hardware to take the guess work out of the flange seal details and the registration of the mold flanges in the X, Y & Z planes. Part Number: 8135 Category: Kits. The JHM Technologies Dynamic Seal starter kit provides all of the needed component hardware to take the guess work out of the flange seal details and the registration of the mold flanges in the X, Y & Z planes. This kit includes all of the seals and groove profiles to allow you to create the precise grooves in the mold flange to fit the mold seals with absolute precision giving the final mold closer the needed positive seal. Also included is the perimeter resin feed channel profile. 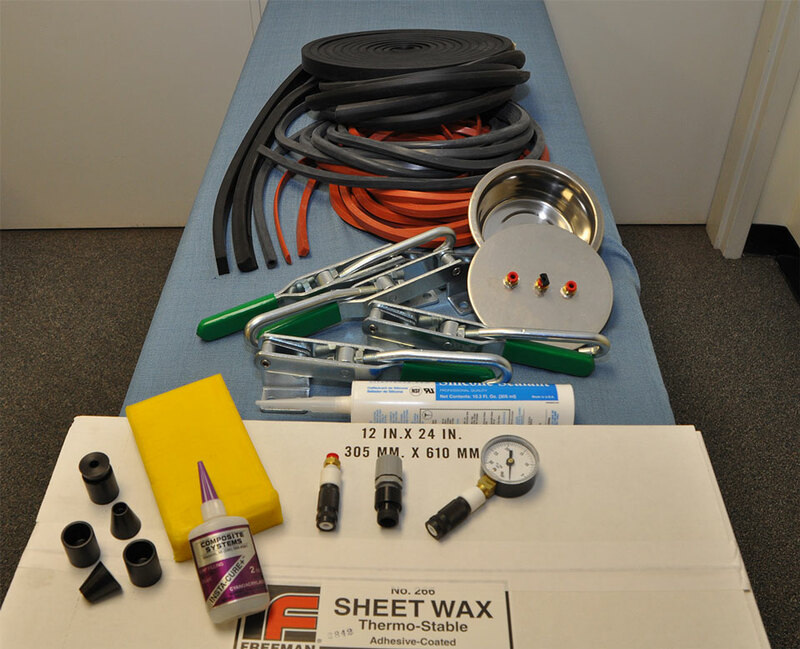 This kit provides all of the special hardware needed for up to 16 feet of mold flange length. Additional flange lengths can be ordered separately in 6 foot increments. The design of this kit is founded on the use of the Dynamic seal which has a proven track record as the premium seal in use for the last 15 years for the RTM and LRTM processes throughout the world. Note: This kit is providing one vent and one injection port, it maybe that your part shape will need more than one, while most molds only need one vent or injection port some shapes with raised “islands” for instance, may need an extra vent if you are not sure please contact our technical team and we can guide you on vent placement and number of vents or injection ports needed. The perimeter clamps should be spaced up to 36″ apart as a typical spacing for a flat mold flange. The sixteen foot of mold flange length as this kit provides for should be covered with only four clamps. Mind you the clamps are only to engage the seals and NOT for holding force to sustain closure with excessive mold pressure. It however maybe that your flange has a deep dip in shape for instance, which would require an extra clamp to pull the flanges together in the dip of the flange. If you have any question as to the number of clamps needed on your mold, please contact our technical group for assistance.